@Guillaume Yeah I just found out about flashcarts when I was checking out a TG-16/PC Engine forum recently. I'm such a noob with homebrew/emulation stuff. Never really looked into it before the whole Xenoblade/Wii modding discussion on the podcast. @Robknoxious1 It's definitely coming out for the Dreamcast at least; there have been a number of post-mortem Dreamcast titles that have been released. Neo Geo is surprising to me though. I wonder how they'll pull that off exactly. I may have to get a Dreamcast for this game (among others, of course) This looks pretty neat. I like how you can actually aim diagonally with your standard weapon now. I still own my old Dreamcast. Mainly bust it out for Rayman 2 and Soul Caliber from time to time (maybe have ten titles still). I would definitely pick this up if it came out on CD and wasn't too expensive. Looks great. 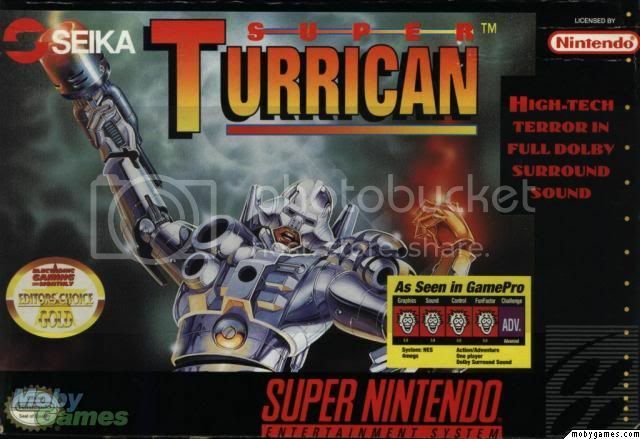 Yeah, Super Turrican was a lost SNES gem which I didn't discover until much-much later (N64 generation). I liked the MegaTurrican better than both Super Turrican and Super Turrican 2 and liked the original Super Turrican the least. I hope this franchise gets resurrected at some point in the future. Super Turrican (on SNES) isn't my favorite game of the serie but I like to launch it sometimes. I finished many years ago, Turrican 3 on Mania setting (remove every one up in the game !) with an autofire pad. I'm not sure I can do it again now ^o^". Maybe I'll give ST a chance :). Stay tuned ;). @Luther That Mania setting sounds really tough! I wonder if there's an equivalent setting in any other Turrican games? Oh, and the hardest Turrican ever is Super Turrican... for the NES, made only by Manfred Trenz ! Just try to beat the first levels with the 4th difficulty setting... ennemies and bullet hell ! Oh and when you die in ST NES, you restard the level from the beguinning ! Hopefully, you can sprint and there's no timer. The NES game came out in America, didn't it? I'll have to check it out one of these days; It's cool that Manfred Trenz made an entire game all on his own.